Natural stone tile stores offer a range of tiles to suit customers’ purpose. Tiles need proper care and maintenance to maintain their looks and strength for years to come. Always use coasters under glasses and jugs, especially those containing citrus juices or alcohol. The acid in the drinks etches the surface leaving it distinctly dull. Countertops should be spread with trivets or mats for hot dishes. It is best to place mats under Chinese ceramics. This is done to avoid scratches on the surface of tiles. Floor surface: Clean, non-treated dry dust mop is used to mop interior floors. The most abrasive materials for natural stone panel tiles include sand, dirt and grit. It is recommended to place mats or area rugs at the entrance to reduce the stance of dust and dirt. This helps in floor scratching. However, care should be taken to install doormats with non-slip undersurface. 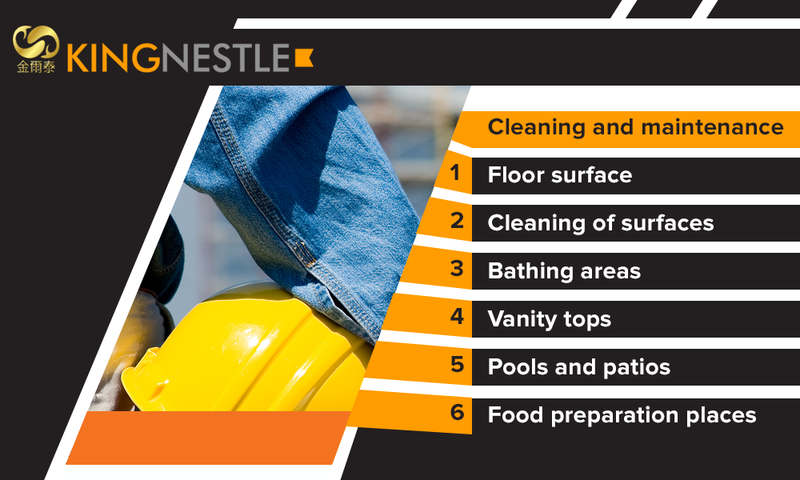 In normal conditions, a person takes eight steps to remove maximum dirt and dust from their shoes. However, this method of dust removal is not feasible. Care should be exercised not to use worn-out or very old vacuum cleaners. The worn-out attachments will definitely scratch the surface. The result is that cleaning procedure with worn-out plastic or metal wheel-attachments turn into scratching material. A natural cleanser is Best To Cleanse Natural Lightweight Honeycomb Panels. One can use a clean rag mop for floors and a soft cloth for other surfaces. Cleaning agents with constituents like lime, vinegar or any acid should be avoided. These days online tile stores also offer mild cleaning agents to clean and then rinse the surface thoroughly. Rinsing should be done with clean water only. It is always good to avoid scouring powder or creams, as these may harm the floor with abrasions. Bathing and adjacent areas are wet and may show white deposits of soap on the edges. These areas should be constantly cleaned with non-acidic soap-scum remover. Alternately, ammonia can be added proportionately cup in a gallon of water to remove soap-scum. It should be noted that regular use of ammonia dulls the surface and makes it sheen-free. Vanity tops should be sealed with penetrating sealer. This should be checked beforehand with Tile Stores, beforehand. Exclusive good-quality marble wax or automobile paste wax is also used to minimize water spotting on vanity top surfaces. Outdoor pools and patios should be flushed with clear and clean water. People can use a mild-bleach solution that removes algae or moss from the area properly. Penetrating sealer is A Must For Natural Stone Tiles for food preparation areas. Users check with tile stores for proper recommendations regarding care and maintenance of tiles. Sealer should be non-toxic, safe and long lasting for their continued use. Sealer manufacturer is also contacted for proper recommendations. So Whether They Are Brick Veneer Panels, sandstone cladding panels, or stone veneer panels, care and maintenance is a must for each of the panels to maintain their properties and shine for a long time.